Is the high school letterman’s jacket a sign of the patriarchy? 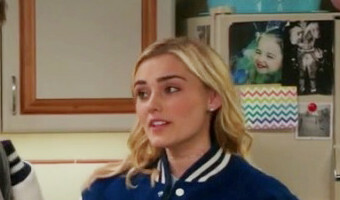 A perspective on the teenage rites of passage donning one's letterman's jacket By Brandon Mercer Published 9:33 am PDT, Friday, October 19, 2018 In ABC's "American Housewife," Season 3, Episode 2, Kate Otto rips into Taylor for wearing her boyfriend's jacket, a sign of the patriarchy. (Image is from the opening of the episode, aired October 3rd on ABC, credit Kapital Entertainment and ABC Studios) less In ABC's "American Housewife," Season 3, Episode 2, Kate Otto rips into Taylor for wearing her boyfriend's jacket, a sign of the patriarchy. (Image is from the opening of the episode, aired October 3rd on ABC, ... more Photo: Kapital Entertainment And ABC Studios In ABC's "American Housewife," Season 3, Episode 2, Kate Otto rips into Taylor for wearing her boyfriend's jacket, a sign of the patriarchy. Taylor later takes off the jacket under her mother's screed. (Image the episode, aired October 3rd on ABC, … [Read more...] about Is the high school letterman’s jacket a sign of the patriarchy?